Who Were the Deadliest Gunmen of the Wild West? A group of famous gunmen of the Wild West. Wyatt Earp is third from the left and Bat Masterson is second from the right. The story of two of them: "Killin'" Jim Miller was an outlaw. "Texas" John Slaughter was a lawman. SHIRLEY GRIFFITH: This is Shirley Griffith. STEVE EMBER: And this is Steve Ember with EXPLORATIONS in VOA Special English. Today, we present the second of two programs about the Old American West. Experts disagree about who were the most dangerous gunmen of the Wild West. However, we will tell you about two of them. One was an outlaw. One was a lawman. SHIRLEY GRIFFITH: There have been hundreds of movies and television programs about the wild and lawless American West. Thousands of books have been written about it. This famous time in American history only lasted about seventy years. The first recorded shooting incident by a person who was a professional gunman took place in Texas in eighteen fifty-four. This violent period ended in about nineteen twenty-four. Some people living in the West at this time became famous. These include men who worked as professional officers of the law, and others who were criminals. Their names were Wyatt Earp, Doc Holliday, Bat Masterson, Billy the Kid, Wild Bill Hickok and the brothers Jesse and Frank James. Books, movies and television programs have made these men more famous today than they were when they were alive. Some of the stories about them are true, but most are only stories. 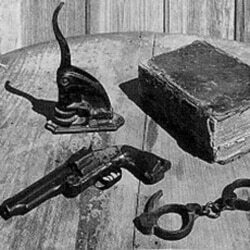 Here are two true stories of the Old West. Our first story begins with a very old photograph that was made in the little town of Pecos, Texas. STEVE EMBER: Close your eyes for a few moments and imagine a very old photograph. The photograph was taken inside a saloon -- a place that served alcohol drinks. It was also where people played card games for money. The photograph clearly shows a group of men sitting in chairs around two tables. Other men are standing against the wall. It is easy to tell that it must be a cold day because several of the men are sitting near a wood stove for warmth. Most of the men are looking at the camera. Most wear boots and the large hats made famous by cowboys. One man wears a smaller, white hat. He is not looking at the camera. He is playing a card game called faro. No one is sitting near him. His left hand is on the table near the cards he will play in the game. His right hand is below the table -- not far from the gun he always carried. His face shows little emotion. SHIRLEY GRIFFITH: This is one of the few photographs known to exist of a very dangerous man named James Miller. He was also known as “Killin’ Jim” or “Killer Miller”. History records show that he was responsible for the deaths of at least twelve people. Jim Miller often said he had killed more than fifty people. The real number of people he killed will never be known. Jim Miller killed people for money. He charged about one hundred fifty dollars to kill a person. He also killed anyone who caused him trouble. One man died a few days after he had spoken in court against Miller. There is no evidence to show who killed the man. However, people were sure Jim Miller was guilty of the crime. STEVE EMBER: Miller was successful at what he did because there was little law enforcement in the areas of Texas and Oklahoma where he lived. And, people were afraid to say anything against Miller. They knew it would mean their lives. One law officer got into a shooting incident with Miller. The lawman shot Miller three times in the chest. Miller fell to the ground. The officer was sure he had killed the dangerous man. A few minutes later, Miller got to his feet. He had not been hurt. He was wearing a steel plate under his shirt. The bullets had hit the steel. The force of the bullets had knocked him down, but had not hurt him. Later, the law officer died from gun shot wounds. No one was sure who shot him. However most people knew Miller had killed again. SHIRLEY GRIFFITH: In nineteen-oh-nine, Miller made a mistake. He was paid money to kill a man in the little town of Ada, Oklahoma. He killed the man in the dark of night. Later, Miller was arrested for the crime. The citizens of Ada knew he had been arrested several times but had always been released for lack of evidence. Also, many people were afraid to speak in court against Miller. Many of the citizens of Ada thought Miller would escape justice again. On Sunday morning, April nineteenth, the citizens of Ada attacked the jail where Miller was being kept. STEVE EMBER: The Old American West had more than its share of bad people like "Killin’" Jim Miller. However, other people worked hard and found good lives in the West. He also fought against Indian raiders from the time he could ride a horse and carry a gun. He fought against both the Apache and the Comanche tribes. SHIRLEY GRIFFITH: John Slaughter was not a very tall man. He was really very small. However, criminals became afraid just looking into his eyes. History records show that John Slaughter took part in at least eight gunfights. This does not include his time as a soldier in the Civil War or fighting against Indians. The records show that he was forced to kill at least four men and possibly two others. These recorded shooting incidents took place when he was an officer of the law. There may have been several more. People who knew John Slaughter said there was no doubt they were dealing with an extremely serious man -- a man who could be very dangerous. One friend of John Slaughter said Texas John was the meanest good man he ever met. STEVE EMBER: John Slaughter worked all his life in the cattle business. He took part in some of the first movements of huge cattle herds from Texas to the railroads in the state of Kansas. He moved from Texas to New Mexico and then to Arizona. In Arizona, he bought a huge ranch to raise cattle. The ranch had more than twenty-six thousand hectares. Part of it was in Arizona, part in Mexico. In eighteen eighty-six, he was elected the lawman or sheriff of Douglas, Arizona, the town near his ranch. Several groups of criminals were working in the area at the time. Soon, many of these outlaws were in jail. Most refused to fight Texas John Slaughter. They surrendered instead. Those who would not immediately surrender faced Sheriff Slaughter’s guns. After two terms as the sheriff, John Slaughter helped the United States Army seek out the famous Apache warrior Geronimo. He helped start the bank in Douglas, Arizona. He later became a representative in the Territorial Government and worked to have Arizona admitted as a state. SHIRLEY GRIFFITH: John Slaughter continued his work on his ranch. He became very wealthy. When he was not working, he was in a local hotel playing card games for large amounts of money. He would often play these games for more than twenty-four hours at a time. John Slaughter represented what was good about the American West. During his long life, Texas John Slaughter was a gunfighter, lawman, soldier, cattle rancher, professional card player and a representative of the state of Arizona. He died in his sleep in February, nineteen twenty-two, at the age of eighty-one. Viola Slaughter, his wife of forty-one years, was by his side. STEVE EMBER: The wild times in the American West ended at about the time of John Slaughter’s death. It was still the American West, but men like John Slaughter made sure it was no longer wild. They helped to bring law and order to the West. SHIRLEY GRIFFITH: This program was written by Paul Thompson. It was produced by Mario Ritter. This is Shirley Griffith. STEVE EMBER: And this is Steve Ember. Visit our re-designed Web site at voaspecialenglish.com. You can read and listen to our programs and add your comments. You can also find a link to our videos on YouTube. Join us again next week for EXPLORATIONS, a program in Special English on the Voice of America.